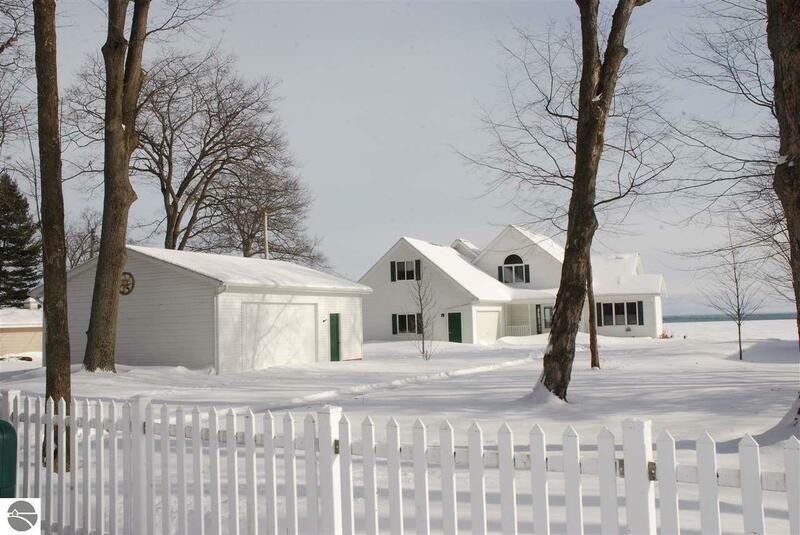 Located on the shores of Lake Huron with views of Tawas Bay, this beautiful home has it all. The home sits on a double lot and is nestled in an area that is one of most desirable along the shoreline. The exterior of the home has a wrap around deck with a back covered porch and a deck along the shoreline. Inside the home you will find hardwood floors in the main entry way, dining room and kitchen. There is carpet throughout the rest of the home with ceramic in the bathrooms. Granite counter tops are in the kitchen and bathrooms as well. The loft has carpet with a built in book shelf, half bath and great views. There is a bonus room above the garage that would work as more sleeping quarters as well as the loft. A see through gas log fireplace is located in the living room and goes through to the master bedroom. The home has central air and the attached garage has stairs to the bonus room and there is access from the interior. An additional large garage is on the property for storage or more vehicles. This awesome home is not far from town and there is a paved bike path that leads that way. The seller has created a list of upgrades for you to review. Pride of ownership shows throughout the property. Waterfront: Water View, Gradual Slope to Water, Great Lake, Yes, 101 Ft.